“Transform, Energise and Clean” or TEC India was the agenda of the 2017-18 Union Budget. The budget included many “wishes” and also identified ten “distinct themes to foster the broad agenda”. 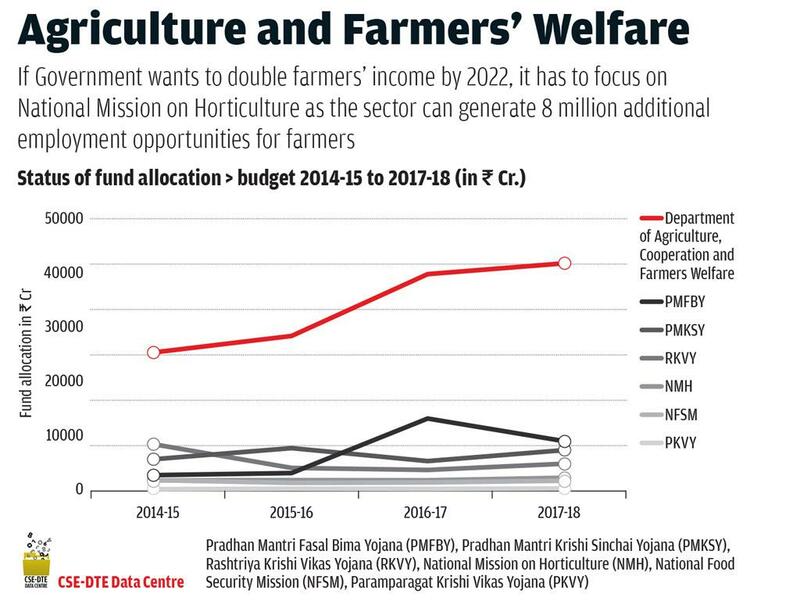 The very first theme is doubling farmers’ income in five years. Specific interventions were outlined for this theme: a) Agricultural credit increased to Rs 10 lakh crore, b) corpus of Rs 40,000 crore for NABARD’s Long Term Irrigation Fund, c) Rs 5,000 crore to micro irrigation, d) a budget provision of Rs 9,000 crore for crop insurance—Fasal Bima Yojana—to increase coverage of cropped area from 30 per cent to 40 per cent and take it to 50 per cent in 2018-19, e) Rs 8,000 crore for infrastructure development fund for dairy. Irrigation was an important input for improving crop productivity until 1980. But continuing to spend on major irrigation projects is certainly not going to double the income of the farmers. Government spending increased from Rs 380 crore in the first five-year plan (1951-56) to Rs 256,000 crore in the twelfth five-year plan (2012-2017). But the cost of creating one ha area under irrigation increased from Rs1, 600 in the first five year plan (1951-56) to nearly Rs160,000 in the tenth plan (2007-08). Now the cost in some projects is more than a million. c) any significant increase in income to farmers. Still, there are 166 major irrigation projects in various stages of completion and estimated cost to complete these projects is Rs 223,000 crore. The net and gross area under irrigation in 1950-51 was 21 million ha and 22.56 million ha respectively. This increased to 68.1 million ha and 95.77 million ha by 2013-14. However, the bulk of this increase in net area happened due to ground water irrigation, entirely developed by farmers. The small and marginal farmers have contributed a great deal to development of irrigation. This is largely through constructing wells, bore wells and tube wells. Famers have added more than 50 million ha of net irrigated area in the country without any government investments. There are 19,757,000 bore wells together irrigating more than 60 per cent of the net and gross irrigated area in the country. Irrigation projects have become a huge opportunity for private sector to bag large contracts. 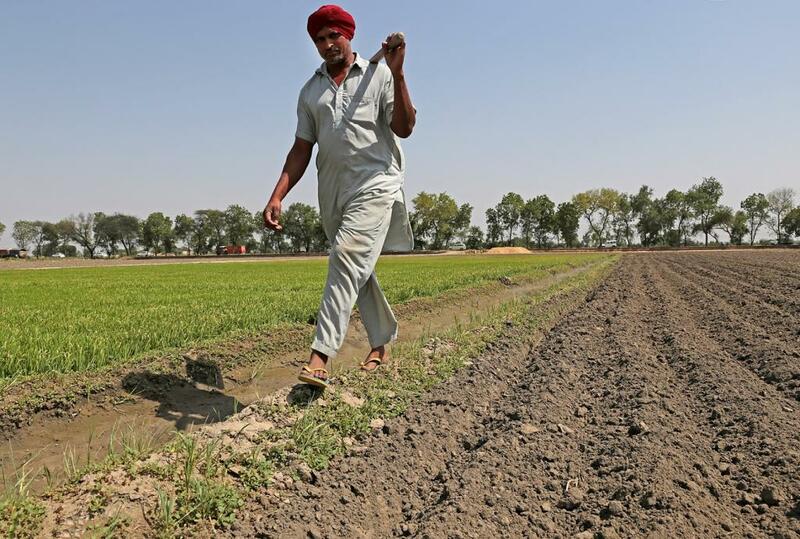 Most often, the cost of creating each ha of land under irrigation runs into millions of rupees. The operational cost of these projects often exceeds the value of the crops produced in the land. Yield increase: India need to focus on improving its yields. Currently, yield level of food crops is 2,056 kg/ha, which is far below the yields of many countries. The current average yield of paddy in India is around 3.5 tonnes /ha, while China’s yield is more than 6 tonnes/ha. Similar is the case with wheat and other major crops. This is despite increase in fertilisers and pesticides by several folds. Water-use efficiency. India is still focusing on supply side management of water. This is leading to major investments while causing degradation of ecosystems without any major benefit to farmers. The investments have to be clearly on reducing the water per unit of production.Currently, the focus of drip irrigation is only on material supply rather than the entire process and training. Creating specific incentives for using less water while improving the productivity have not even initiated. With modern technology, it is possible to create incentives to use less water and set up mechanisms to monitor water use at farm level. Budget should be allocated for creating well-designed projects with institutional mechanisms to implement and monitor. The goal is to use the existing infrastructure far more efficiently—both at system level and individual farm level. Diversity of food grains: Consumers are aware of the benefits of eating coarse grains such as jowar and bajra. But there are no specific programmes to produce and market these food grains. Farmers need income, not just production. So, incentivising farmers to produce these grains will not only save water and ecosystems but promote healthy eating habits. Farm-based approaches: In India, farmers are receptive to experimenting with farm-based approaches. For example, the System of Rice Intensification (SRI), Sustainable Sugarcane Initiative (SSI), and System of Crop Intensification (SCI) of wheat, millets and mustard are very popular with farmers. It is time we had Centre-sponsored scheme to promote these approaches in large scale with large budget provisions and institutional mechanisms. Organic agriculture: India needs to slowly move from chemical-based farming to organic farming. Phase-wise approach towards removing subsidies to chemical fertilisers and introducing incentives to organic agriculture through budget provisions is the way to go about it. Hopefully, 2018-19Budget will begin with real efforts to promote sustainable agriculture with less water and less chemical fertilisers by initiating programmes mentioned above with specific budget provisions. A centrally-sponsored sustainable agriculture programme with comparable budget allocation of Rs 50,000 crore is the need of the hour. Such programmes need an institutional mechanism to design and implement the proven methods to reduce water, chemicals, while significantly improving the productivity at farm level and improving rural employment. There is need to create demonstrable models which can double the income of farmers while saving water. Many state governments are promoting methods such as SRI and SCI, but in very small scale and with very small budgets. They have no institutional mechanism to scale up. It is time to invest in these methods.